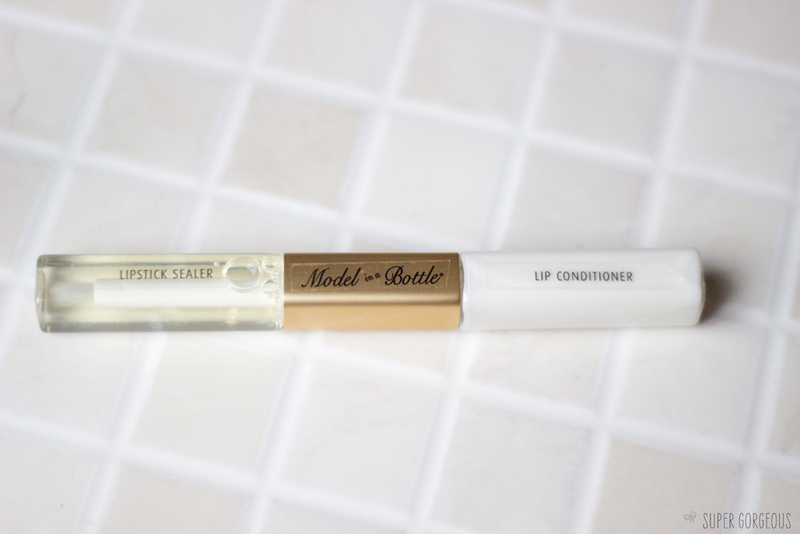 You may have heard about Model In a Bottle's setting spray - it seems to have become somewhat of a cult product to set makeup with... well now they have released their Duo Lip Conditioner and Lipstick Sealer, which is designed to keep your lipstick locked in place all day. It comes in a double ended tube - one end for the conditioner, another for the sealer. I was slightly disappointed with the way the packaging is designed - the outer casing is fab, but the actual tube has no markings on it, and the names and logo stuck on with a sticker which I think cheapens it a little. That aside - if it works, who cares! The lip conditioner is a water-based, creamy, non-shiny, non-greasy formula which is applied with a doe-foot sponge applicator. It doesn't have a taste and feels comfortable on the lips. 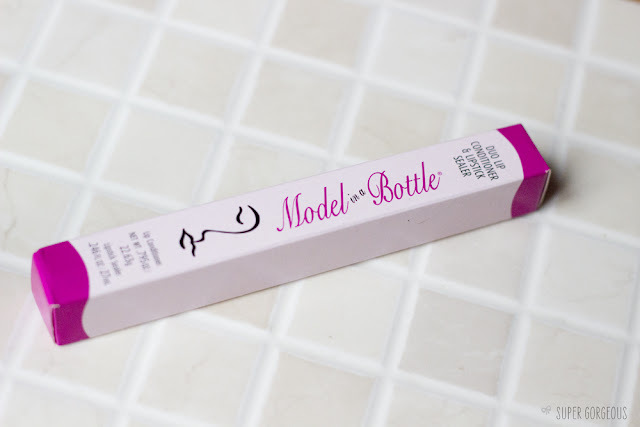 You put this on 30 seconds before your lipstick, to give your lips a good moisturising base for the lipstick and sealer. 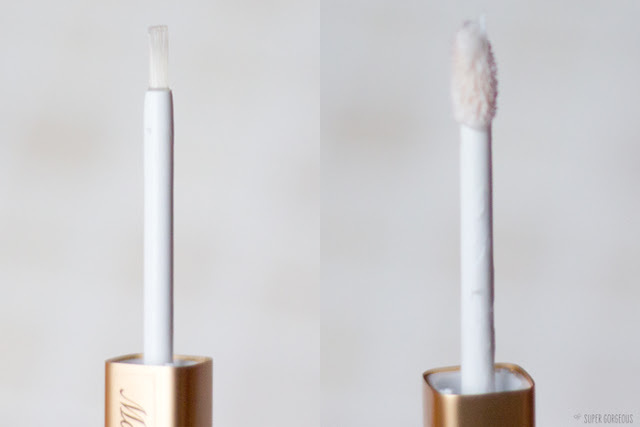 Once your lipstick has been applied, you blot your lips to remove any excess, then apply the sealer with the brush which is easy to use. It is very alcoholic smelling, a little bit tingly, but that wears off after a few seconds as it dries. You leave your lips parted while it dries, which is done within 30 seconds - then you're good to go, taking care not to eat or drink for the first 10 minutes while it cures. I put it to the test and although it didn't make my lipstick last all day, it definitely made it last a lot longer than normal. It wasn't until the fifth hour of wear that I noticed the most difference. I still had some of the colour on my lips, but mainly around the edges, which, although it's not perfect, I find impressive for a day full of chatting, eating and drinking! I think the lip conditioner is a really wise addition to the standard lip sealer, as the high alcohol content can be quite drying. Using the Model in a Bottle Lip Duo together was the most comforting sealant I've tried on my lips. I'd use this on my brides to help their lipstick to last on their special day, and also on nights out and special occasions for myself. It doesn't give you modelesque lips all day, but it's definitely an improvement on nothing and extends the wear by a good few hours! All make up products are very good look on your face ! I love ur blog and makeup style.